Drawing with a pen and paper is hard enough (unless you count those little hearts with smiley faces that we put on all of our memos), but drawing with nothing but sound just seems crazy. 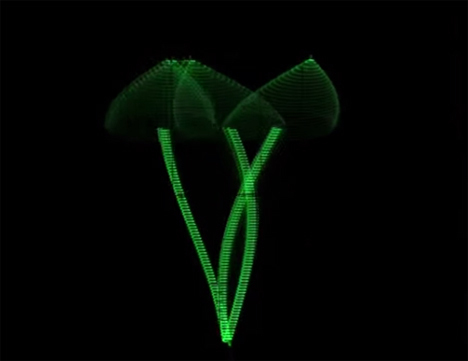 Jerobeam Fenderson accomplished a surprisingly awesome work of art using nothing more than sound waves and an old analog Tektronix oscilloscope. Fenderson uses two channels from his audio interface – left and right – to create waveforms, otherwise known as sounds. He feeds the sounds into his oscilloscope, where one channel causes horizontal deflection and the other causes vertical deflection. Using some math and seriously impressive skills, he turns the sounds into pictures. Dancing pictures. Of mushrooms. As can probably be expected, Fenderson has received plenty of emails telling him that his awesome project must be faked. However, he offers up complete details as well as a WAV file for other people to try it out. 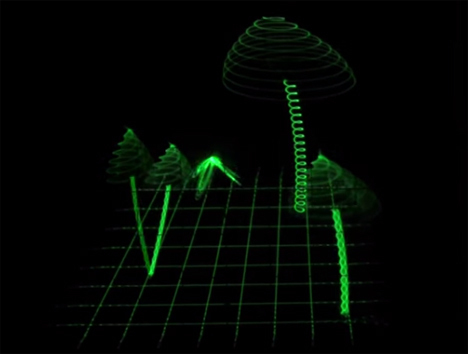 He hasn’t yet drawn an oscilloscope on mushrooms, which is apparently another frequently asked question on his site, but welcomes pictures from anyone who does manage it.